ALLEY FRIENDS ARCHITECTS The Alley Friends Architects (AFA) projects shown below represent a few samples of passive solar buildings, urban recycling solutions, and artist ventures. 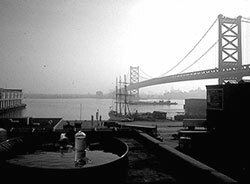 AFA partners Alan Charles Johnson, Richard Carl Stange, and Bruce Eugene Millard set up their design facilities and residential lofts in seven abandoned warehouses on the banks of the Delaware River in Philadelphia. The structures demonstrate how discarded urban buildings, neighborhoods, and human energy can be recycled into new urban communities. The AFA explored solving their personal living needs with minimal natural resources. They collected wood from urban waste piles and renovated buildings to heat the warehouses. 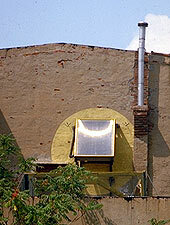 They used the neighborhood's manufacturing trash to build a passive solar hot water heater. 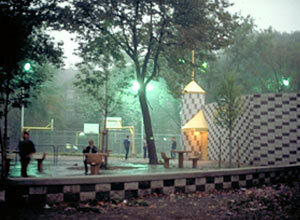 The buildings were renovated with recycled materials and art objects from city streets and abandoned buildings. See "The Wizard's Eye." The firm's architectural projects focused on reuse of the urban framework, its energy, and its buildings. Their 'activist planning' role saved many late 1800's architectural gems from the wrecking ball in East Powelton of Philadelphia. After a decade-long legal battle, some tenants restored the buildings into much-needed urban housing, while developers renovated other buildings. At Dickinson Square Park, AFA redesigned vanda-lized public facilities with durability and fun as the focus. AFA designed this 2000 sq ft passive-solar residence for an organic gardening and bee-keeping couple in suburban Philadelphia. The attached greenhouse is a breakfast room and a spring and fall garden. The greenhouse and direct-gain glazing provide 75% of the home's heating needs. Polished aluminum panels reflect increased solar gain. 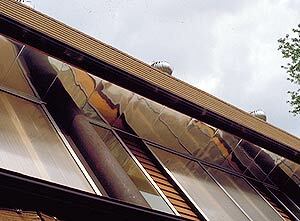 A passive cooling tube draws summer heat from the greenhouse to vent plenum and passive turbine vents. 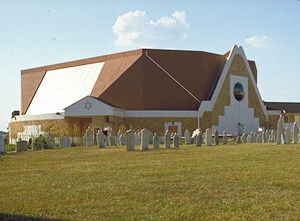 Institutional architectural projects included this suburban Philadelphia synagogue. The 1000-seat facility was an addition to an existing church structure. 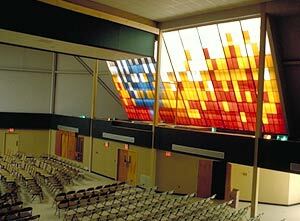 A large passive-solar collector 'solar tempers' the building and doubles as religious art. 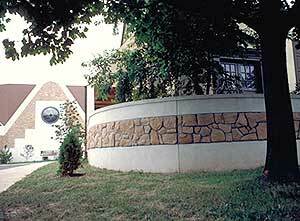 Two double-wall fiberglass panels sandwich layers of black metal lath to absorb solar heat gain. 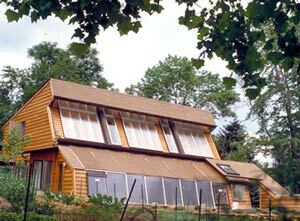 Warmed air circulates to the interior for solar heating, or vents to the exterior when heat is not required. 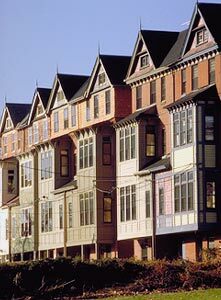 This urban infill project places twelve townhouse condominiums within the massing for two larger houses. The irregular quarter-acre site features underground parking and an urban courtyard, and each unit has a private entrance. Trellis and brick were recycled from a previous on-site warehouse. The firm designed this office-industrial park for a regional wholesaler in New Jersey. 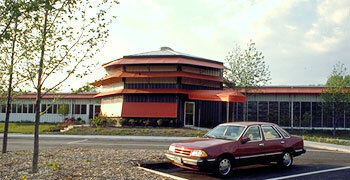 Direct-gain passive-solar windows and trombe wall elements lower heating costs for this customized steel building. 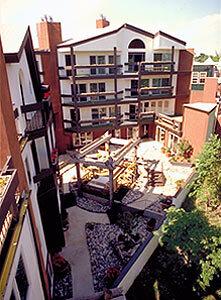 AFA projects included all aspects of design. Above, the firm's partners created art with their inflatable toy invention, at Art Park in upstate New York, in 1975. 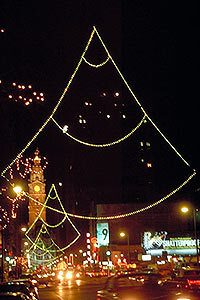 At the right, the firm's light sculptures hang above Broad Street in Philadelphia. 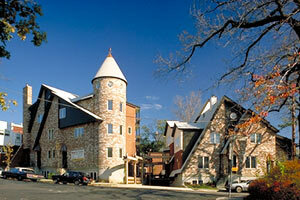 All photos on this page are copy written by Alley Friends Architects.